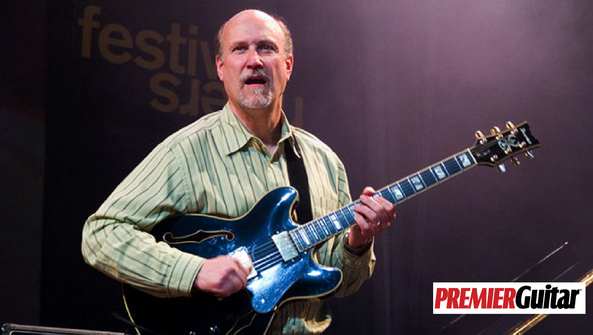 John Scofield is the embodiment of fusion. When he began recording as a leader in the late '70s, his fluid blend of jazz, bebop, blues, rock, and country music must have presented a marketing nightmare for the label. Scofield attended the prestigious Berklee College of Music, but his influences are anything but expected, and his sophisticated sound incorporates deep groove influences. As an improviser, he reveals an effortless command of modern, angular, and chromatic vocabulary. For this column, I've recorded a simple bass loop over a funky 16th-note shuffle groove. The line indicates the A Dorian mode (A–B–C–D–E–F#–G), but since the harmonic information is so sparse, it's pretty easy to insert other sounds and make them work.